Buying and holding buildings for arts uses. In "BTMFBA: the best way to ward off artist or retail displacement is to buy the building" I discussed my incredulity at how the local arts community in DC doesn't seem to understand that if they don't want to be displaced, they have to own the properties they are using for artistic endeavor. In Pittsburgh, the Pittsburgh Cultural Trust runs a number of downtown cultural establishments. 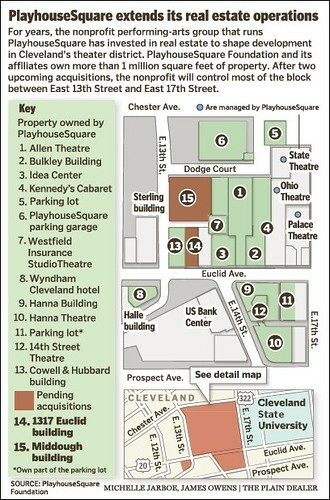 The Playhouse Square Foundation does the same thing in Cleveland, but also takes on a greater role in real estate development beyond arts uses. I wrote about Cleveland here, "Real estate value capture and the arts." At the neighborhood scale, the Gordon Square Arts District in Cleveland is another example. But there are hundreds of such examples across the country. Buying and holding retail spaces for retail uses, rented at below market rates. Comparably, in Paris, the Vital'Quartier initiative charged the community development corporation SEMAEST to buy and hold real estate and rent it to desired retailers at sub-market prices. According to Next Paris ("Opération Vital'Quartier: pour le commerce de proximité à Paris!") so far the initiative has supported 372 businesses and controls more than 500,000 s.f. of in-demand retail space. What do you do when the arts organization sells the property to the highest bidder and the space is removed from the portfolio of civic assets supporting arts (or other public) uses? There are many examples of arts uses being a component of an otherwise for profit development. Usually these are generated by proffers by a developer in return for zoning bonuses and other allowances. If they are negotiated well, the artist use is protected in perpetuity by an easement. But a lot of times, at least in DC, such proffers are not protected by including easements or other protections to keep the space dedicated to arts uses. Instead there is a belief that the organization "can be trusted" to do so. A few years ago, in the case of The Source theatre, the city had to step in and stop the conversion of the sale of the building to a restaurant group ("Debt-Ridden Source Theatre Closes, Plans to Sell Building," Post). But that was a rare direct action by the city, which had provided capital improvement funds to the theatre company. where they represented the public interest in nonprofit organization's operations. But sadly, the Corcoran was allowed to shut down ("National Gallery of Art acquires 331 more works from the Corcoran," Post). In "Should community culture master plans include elements on higher education arts programs?" I realized two years too late that the idea should have been "put out there" that the city should have taken over the Gallery and converted it into a locally-focused fine arts museum. Mather Building, G Street NW, Washington, DC. 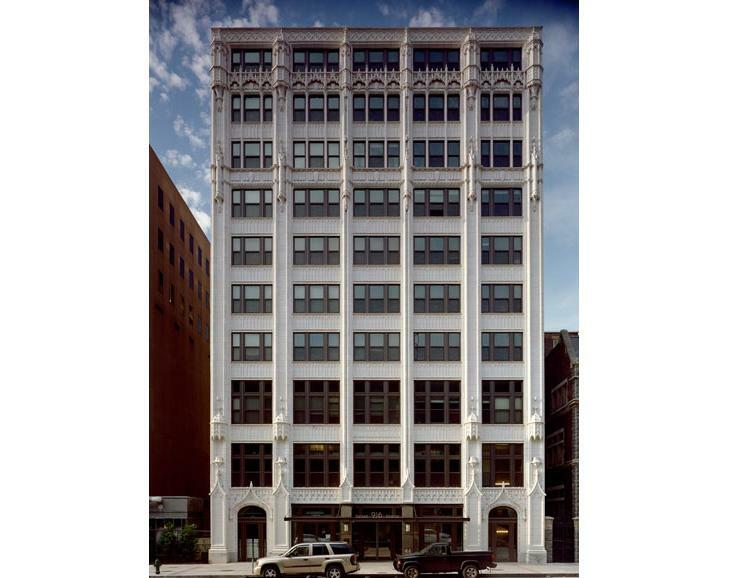 Another case of an arts group selling their space to the highest bidder is the Cultural Development Corporation, which had two floors of the Mather Building, located across the street from the Martin Luther King Library. The building was converted to a condominium more than a decade ago ("D.C. sells long-vacant Mather Building" Washington Times; "Mather Building Renovation Set," Washington Post, 2001), and because it was in an arts overlay zone promoting arts uses downtown, some of the housing was sold to artists (live-work) at a discount, and space was provided--to Cultural Development Corporation--for arts uses. CulturalDC, a prominent D.C. arts incubator, has sold its downtown office space and will search for new headquarters. CulturalDC will continue to operate Source, its theater space on 14th Street NW, and other programs around the District, but it will be shuttering Flashpoint, the longtime art gallery that shares its home at 916 G St. NW. The organization put the second floor of its Gallery Place base up for sale last fall, according to interim executive director Tanya Hilton. Groups such as Fringe Festival, Washington Improv Theater, and Step Afrika! got their start in that second-floor incubator space. “Twelve years ago, it was a thriving haven for artists and nonprofits that had a need for administrative space,” Hilton says, but in recent years the space has since gone under-used. While CulturalDC only intended to sell its second floor, Joe Reger, principal for JCR Companies, approached CulturalDC with an offer for both: the offices as well as the storefront gallery Flashpoint and the black box Mead Theatre Lab. I believe that in such situations, it should be automatic that the Attorney General's office initiate a review of the transaction, and that it likely would be best for there to be an automatic "pre-sale" review of such transactions to determine whether or not they are in the public interest. I would aver that the transaction should not go through, if keeping arts spaces downtown is a planning priority, and because the Cultural Development Corporation received control of these properties through extra-normal consideration and preference within land use planning processes. Note that I recognize that an arts organization "incubator" or office space doesn't have to be Downtown. But losing a gallery in a prominent location is an unrecoverable loss. 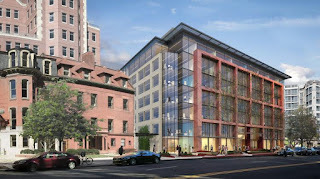 The YMCA at Rhode Island and 17th Street NW as another example. I never got around to writing about a similar experience with the YMCA in Dupont Circle. They sold their property to a developer and the recreation use at that site was abandoned. The National Capital facility was never a typical one for the YMCA. The nonprofit organization traditionally serves neighborhoods, not business districts, and Reese-Hawkins said the money from the sale of the building will boost the organization’s community, after-school and summer programs throughout the region. She hopes to eventually open another full-service YMCA in the city and is in talks with community leaders to assess the best fit. There are no gyms in the District east of the Anacostia River, and Reese-Hawkins said it is possible that one could land there. The building that will replace the YMCA. DC activities should benefit disproportionately from the sale of the property, since it enjoyed property tax exemption benefits conferred by DC and it is likely that this facility was one of the highest value assets owned by the organization. The public interest in the disposition of that property should be protected at the very least by an automatic cy pres review of the transaction. Granted, DC has fewer options than other jurisdictions because of the height limit. For example, a way that the YMCA could have generated money from the value of the property would have been to sell a form of "transferable development rights" to a developer to make a bigger property elsewhere. But for the most part that is a tool not available in DC because of the height limit. Note that a cy pres review isn't a slam dunk. In New York State ("A New Cooper Union," Student Activism), California, and Pennsylvania there are many examples of the State AG engaging in such matters and representing the public interest. However, in DC, so far the AG's Office hasn't proved to be all that willing to buck real estate interests, which are the leading industry in the city, and these transactions generally benefit real estate development at the expense of the public interest. But in terms of developing the capacity of the DC Attorney General's Office to one day take over criminal prosecution authority from the federal government, developing a proactive approach to oversight of nonprofit organizations in the city would be an important step ("Participatory "budgeting" and disposition of funds from legal settlements"). Who knew those sign flippers get training?